Experience Nepal Off the Tourist Path! 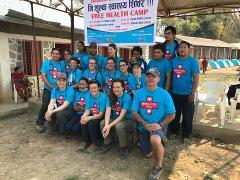 Find out why the most common remark about Medical Trek Nepal is “this was a life changing experience.” Humbling, hard and well worth it. You'll make memories and friendships that last a life time! Education = Equality! 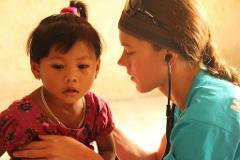 Join our volunteer trek to remote village schools. You do not need to be a teacher, or have school experience. We need volunteers to help us deliver supplies, read with children, teach sports, etc. On the Everest Base Camp Trek experience the great natural beauty of Nepal – home to Himalayan Thar, musk deer and Nepal’s national bird, the brightly coloured Danphe pheasant.The Khumbu region is also famous for its magnificent mountains. Join Fitness Trek Nepal! You get a 21-day life changing challenge that starts with your guided fitness training before you leave your home country. Add these additional 2 weeks in hospital to your Medical Trek to create a 4 week elective program that qualifies for most university internships or filed study. You will do 2 weeks on Medical Trek either before or after this 2 weeks.